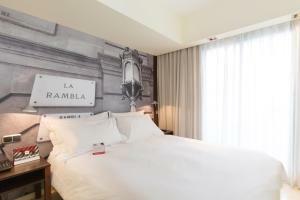 Hotel Expo Barcelona is located next to Barcelona Sants Station. Its rooftop pool and terrace offer fantastic city views and the modern rooms feature a private balcony and satellite TV. Montjuïc Hill, where you can find the Joan Miró Museum and Barcelona’s Fira Congress Centre, is 10 minutes’ walk away. Barcelona FC’s Camp Nou Stadium is just one metro stop away. Rate: € 61.70 ... € 194.47; select dates below to get current rates. Located on the higher floors of the building, this bright and comfortable rooms feature modern décor and have a balcony, minibar, and air conditioning. The bathroom comes with free toiletries, bath, and hairdryer. Rate: € 78.37 ... € 214.11; select dates below to get current rates.